Based on research and feedback from the original Every Child Ready to Read® (ECRR) program, the ECRR Second Edition continues to focus on the parent/caregiver as well as on community partnerships and outreach efforts. 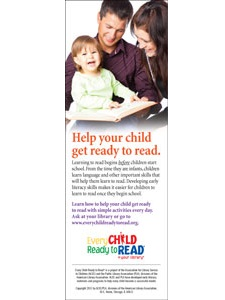 Hand out this informative bookmark to promote ECRR workshops and to inform patrons of the importance of early literacy education at home. Bookmarks are sold in packs of 100.